What types of special events do you have? At Mad Science, our special events can fit any type of event that you are hosting. For example, our special events can take the form of shows, science days and fairs, and science booths. 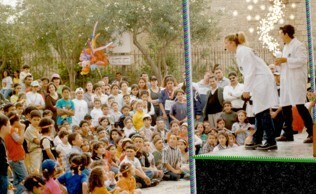 How many children can a show accommodate? Between 50 and 500 children at a time. We can adjust our shows to the size of your venue and to your budget. Is this like a magic show? NO! We want to show the kids the DIFFERENCE between magic and science. Sure, magic is fun - and, in fact, we start the show with a magic trick - but with science there are no secrets! We as Mad Scientists get to tell everyone how everything works! We'll do lots fun, visually interesting experiments, with plenty of opportunities for helpers! Our inquiry-based presentation ensures that the show isn't a lecture. We want the kids to tell US what's going to happen. We pose problems and "what-ifs" and let THEM work out hypotheses that WE test out! Fit an egg into an impossibly small space! Blow up a 10-foot bag in one breath! Float a beach ball 15 feet over everyone's head! Create a fog storm just like in the movies! Create our own hot-air balloon! Blow out a candle from across the room! Give brave volunteers a ride on a hovercraft! What age levels are the shows appropriate for? Kindergarteners through 6th-graders tend to get the most out of our shows, but younger or older kids will certainly have a blast. Younger kids will love what they see and older kids will love learning WHY things happen. The Mad Scientist will always tailor the show to the age group - giving older kids a bit more explanation than with a younger group. Is there really educational value? Absolutely! While the kids may not themselves be aware that they are learning, parents and teachers certainly are. Our Special Events are based on the same teaching methods and materials used in our classroom programs, but with even more entertainment thrown in. Aside from the specific material covered, the kids will become very familiar with the concepts of observation, hypotheses, and experimentation. You better believe it! As much as we want kids to have fun, it's even more important to us that they be safe. Most of what we use are household items used in new and creative ways. Some experiments, due to the equipment involved, are for the Mad Scientist only - which, of course, is made perfectly clear! 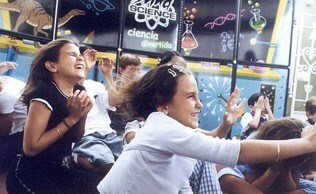 A Mad Science Special Event runs for about 45-60 minutes. Could we do even more stuff if we wanted to? Well...OK. After the show, we can set up activity booths where children can meet the Mad Scientist and see some cool experiments up close or maybe even make something to take home! Dry Ice, Slime Making, Airplane Making, Putty Making, and more! Call us for available booth activities! Yeah yeah, so how much already? Please call or e-mail us for pricing information. Pricing is based on a few variables, including the number of shows booked and distance from our office. Remember, that Mad Science is confident in the quality of its programming and we are 100% guaranteed. Enough for your guests to be comfortable as well as a fair-size "safety zone" in which the Mad Scientist can perform. While the experiments are perfectly safe, we want to be sure no one is tripping over our equipment and that the Mad Scientist isn't tripping over your guests! Do you need an auditorium or other formal setting? No way! We can work in many different audience settings! Seating in chairs or on floors is perfectly acceptable - however your guests are most comfortable. If you expect a large group, a center aisle works very well for making sure no one in the back is slighted - our Mad Scientists can cover a lot of ground! What does the Mad Scientist bring and what do we need to provide? A table. A standard 6-foot or larger table works great. Lots of kids ready to have fun! If these are not available, just let us know, and we will adjust accordingly. How much preparation time does the Mad Scientist need? Is this going to make a big ol' mess or what? Nope! The Mad Scientist cleans up after themselves when they are done! You won't even know they've been there! (Except the kids will be much happier than they were before the show.) The Mad Scientist will have a table cover for the show table and will pack up all of their materials and carry any trash or debris out with them. There's a particular Mad Scientist that we really like! Could we request him or her? Our Mad Scientists recognize the great compliment it is to be specifically requested for a program. Unfortunately, due to the number of programs we run and the intricacies of program scheduling, travel, equipment distribution, and time off for our instructors, we cannot guarantee a specific Mad Scientist for a specific program. While we will make every reasonable effort to accommodate requests, we can only assure you that you will be satisfied with the excellent Mad Scientist that does your program, whomever it may be.